ThinkPad? No, not quite. Appreciated by ThinkPad enthusiasts, on the other hand...absolutely! I have recently purchased three "untested junk" PC 110s (PC110? there is a space between PC and 110, but it's a small space...) from Japan. Two of the three have been received; the third is coming soon, along with something else as well. As hard as I fight imgur, it refuses to order the pics correctly, so...it's a mess. So far I've had both of them completely apart and cleaned up battery leakage of the murderous little NiMH backup batteries. Both of them appear to be 100% functional except one has a trash screen. The third in transit also has a trash screen. Mods: couldn't decide between here and ThinkPad Legacy. Move if you deem appropriate. That's pretty cool. I can't believe how antiquated they look. Just a mere 25 years ago, and now we have four times or more processing power in a pocket size smart phone. Wow. Kishy: Great find. Ship a broken screen to Nitrocaster and see if he can shoehorn in a 1920x1440 display or something! I think your underestimating CPU power in modern devices or overestimating the power of the 486. A 100mhz 486 could BARELY pull together enough power to play a medium quality MP3. A modern machine can do that....download the data from a tower, decode the information over the internet and still have enough power left over to render a few thousand polygons shaded and rendered 60 times a second for a few hours straight. And you say it's only 4x more powerful? Probably still a bit low. A safe assumption is a leading edge super computer is 15 years prior to when the desktop market is comparable. The Cray 2 computer only has a third of the power of an iPhone 5, therefore an iPhone 5 is about equal to a Pentium Pro - Pentium II. A 486DX33 can do around 10 MIPS. A Pentium Pro can do around 500 MIPS. That's 50x faster. Phones have come a long way since the iPhone 5 in 2012. It's 2018. I bet that's closer to 250x on most flagships. Maybe if you said a modern high end feature phone or very low end Android phone? 40x might just work. If Nitrocaster thinks he can fix the screen with something good, I'd consider it. I would have ballparked the capabilities of a 486SX-33 at "thousands of times less capable" than current stuff, lol. My observations about the PC 110 go somewhat in a different direction, though. For its time this is easily the smallest reasonably fully-featured notebook PC. Although today we can put more capability into a smaller package (e.g. smartphone), in 1995 that was not the case. This unit is expandable with the technologies of the day (CF slot, 2x PCMCIA) which make it quite a bit bigger than it otherwise needed to be. It has an internal modem...and was capable of being used as a telephone...this is an incredible little device. So, I received the third one last night. I have added the photos to the imgur album accessible via the same link (https://imgur.com/a/3JbJDqG). I have arranged the photos in order, successfully, so the new ones show up after the closeup of the AC adapter specs. New one had minor battery corrosion but no PCB damage. Cleaned it successfully. LCD is screwed. It displays stuff, but it's screwed. Video is present on imgur. Apologies for how awful it is, and it being vertical, it was recorded with Facebook Messenger to be sent directly to a friend but I later realized it's the only image I have of the third screen. The motherboard appears to work but I have not swapped my good LCD to it, to verify the flickering is entirely the LCD and not at all the motherboard. I don't really want to take my 'good one' apart again, at least not soon. This unit came with a 16MB RAM upgrade in it! I have transferred that into my 'good one'. The other two both came with a 4MB module. This unit came with a 15MB (fifteen??) CF card, which contains some application, but it doesn't want to launch from the DOS/J prompt so I think this machine probably had a PCMCIA HDD in it at some point. I pulled the non-flickering, non-displaying LCD out of its lid assembly for reference pics. Since it's junk, it's staying out of the computer. I definitely do not have a surplus of good screens lol. Plans moving forward include getting a PCMCIA HDD or appropriately sized CF card (CF seems preferable) and putting Win95 on the good one. 20MB of RAM is adequate for that and then some. To me it looks like a polarizer issue and I've seen similar screens do that but the image is still faintly visisble even if the color and contrast are screwball. You might want to also talk to xiphmont and see if new polarizers can be on your broken LCDs since they all seem to just have the "ring" polarizer problem. Especially for the one you took out...it's not you can make that display any worse. Also...is that square thing above the keyboard a track pad...or if it is not what is it? There is a guy, I think in Alaska, offering a refurb service to fix these LCDs. If he thinks he has a method to do it, then surely it must be possible. Probably requires some specialized knowledge and perhaps special tools which I don't have...do note however there are fine surface cracks in both of my bad LCDs. They don't show any evidence of impact, it's almost like the plastic experienced some sort of thermal shock. The rectangular pad is a signature and drawing pad; DOS in flash loads a driver that supports it, and then Personaware has a drawing utility that can recognize input from it. From my past reading apparently there might be a way to make it act like a mouse trackpad (modified drivers?) but it isn't the original design intention. The red dot in the upper left is a pointing device similar in usage to a TrackPoint. The mouse buttons are duplicated on both sides of the machine which is actually pretty handy. Disclaimer: I'm new to these machines. All that I know comes from my limited hands-on experience, and past reading (I've wanted one for years). If it is indeed only the polarizer film, then this (and many!) PC 110 can be repaired with a bit of surgery that doesn't even look that difficult. Since I've got two bad screens it seems silly not to try it. The one with the nasty flicker has some other issue in addition, of course. To follow up on that thought: it is 100% not a polarizer defect. The large 'ring of death', for lack of a better term, is inside of the LCD panel. I can confirm this because I peeled back one of the polarizers enough to verify. The opacity issue is inside the LCD itself. Additionally, the hairline cracks are not in the polarizer surface but are in the LCD panel itself. There seems to possibly be a correlation between the cracks existing and the big blotchy ring happening. One of them may be causing the other, and I'm thinking it's (whatever causes the ring to appear) that causes the cracks to form. Is it possible that thermal conditions can cause the inside of the panel to expand and crack? Regardless, it's not the polarizer, and it's not the adhesive for the polarizer. At least not on my two with issues. My one with a good screen is in fact only marginally good. It has the beginnings of the big blotchy ring, but no visible cracks. There is a certain priority, then, on figuring out a commercially available replacement screen that doesn't suffer these same issues. I think this is probably more available than anyone realizes, but figuring out what that special screen is/what application it's for is going to be the challenging part. Surprisingly...that screen is the ONLY 4.7" 640X480 LCD ever made. You can get 4.4 and 5 without an issue though. I have purchased the docking station from Japan, and the floppy drive from the Netherlands. Both work as expected which is great. In a perfect world I still want to acquire the keyboard adapter cable to use a PS/2 device without requiring the dock, but it will be very hard to find this item individually. 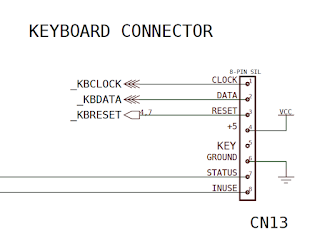 I'm exploring the option of making one, but I need a pinout for the original one, and I am not quite sure who to approach about getting that information. Of course, any progress I make in that area will become public knowledge soon after my success. ThinkPad 600 and PC 110 external floppy drives use the same physical connector. In the case of the TP 600, the drive slides into an enclosure, and the enclosure then plugs into the laptop directly. The PC 110 drive plugs into the docking station. It is known that the PC 110 is unable to boot from the TP 600 FDD. It is able to read/write the TP 600 FDD after the PC 110 boots into an OS, but cannot boot from it. In reverse, the PC 110 FDD works on the TP 600 computer. After taking both apart and studying them extensively, involving a lot of connector probing with my multimeter, I discovered the difference and was able to modify the TP 600 drive assembly to be able to boot the PC 110. The modification still allows the drive to work with the TP 600, of course. I will be documenting this publicly soon. This should give you an idea! i can provide photos on request. I am based in Singapore. thanks! Please post this in the marketplace section instead of hijacking an old thread.